(Bloomberg) -- For a 145-year-old tobacco supplier, the future is in cannabis. As Canada prepares to legalize marijuana next month, and regulations continue to loosen in the U.S. and other markets, Alliance One International Inc. is the latest company pivoting to pot. With a valuation just north of $215 million, the North Carolina-based company is banking on the Canadian market to drive growth as tobacco cigarette smoking rates stagnate around the globe. The move comes as investors are pouring billions of dollars into the burgeoning industry, catapulting the value of cannabis stocks. As part of its shift, Alliance is changing its name to Pyxus International Inc. as of Wednesday. The company historically has purchased, processed, packaged and shipped tobacco to cigarette manufacturers. It posted sales of $1.85 billion in its most recent fiscal year, returning to growth after three straight years of declines. It carries more than $900 million in debt. As smoking rates decline, Alliance has been expanding into the market for tobacco vape products. And it now has stakes in two Canadian cannabis companies, in Ontario and on Prince Edward Island. Marijuana will be legal for recreational use by adults in Canada next month. Pot stocks have been on a tear since Constellation Brands Inc., the maker of Robert Mondavi wine and U.S. distributor of Modelo beer, announced it was boosting its stake in the Canadian company Canopy Growth, making a $3.8 billion investment. 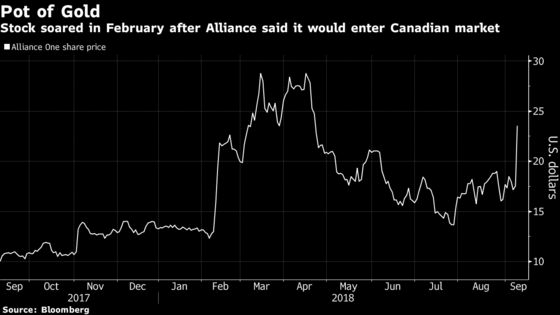 Alliance saw the power of cannabis to juice stock prices firsthand in February when its shares surged after it said it was entering the Canadian market. The stock has more than doubled over the past year. The shares jumped 36 percent on Tuesday as the company prepared to update investors on its cannabis strategy. In addition to its new name, it changed its stock symbol to PYX. While a handful of U.S. states allow recreational use, marijuana remains illegal on a federal level and the prohibition has kept many banks, big companies and institutional investors on the sidelines. For tobacco companies, a move into cannabis might not be a slam dunk, according to Ken Shea, an analyst at Bloomberg Intelligence. Just as cigarette smokers are moving to non-combustible products like vape pens, cannabis users have embraced edibles and other forms of ingestion beyond smoking, he said. And the market for those products is very competitive, without the barriers to entry that have long boosted existing tobacco companies.